When your body gets an infection or needs some dead cells removed, monocytes are a key player. They are part of the team that helps keeps you healthy. In other words, monocytes function as part of your immune system. More specifically, they are a type of white blood cell, or leukocyte, manufactured in the bone marrow. From there, monocytes travel through your blood and into tissue where they transition into macrophages and dendritic cells. A macrophage is a type of phagocyte, which is an immune cell responsible for detecting, engulfing, and destroying harmful microorganisms (pathogens) and foreign materials like bacterial or viral infections. Monocytes should represent about one percent to 10% of your circulating white blood cells. Your levels can be tested as part of a complete blood count (CBC) test. Monocyte counts fluctuate, but if they are regularly outside of the normal range, it could indicate a health concern. What Is a Monocyte Count? What Causes High Monocyte Counts (Monocytosis)? What Causes Low Monocyte Counts (Monocytopenia)? Monocytes are part of your body’s natural defense mechanism. They serve three main functions: phagocytosis, antigen presentation, and cytokine production. Phagocytosis: This is the process during which macrophages consume harmful bacterial, fungal, and viral pathogens before killing them and breaking them down into smaller particles. Antigen presentation: Antigen-presenting macrophages and dendritic cells help other white blood cells detect harmful invaders by posting the pathogen’s identifying substances (antigens) on its body. This triggers the production of antibodies. Cytokine production: The presence of pathogens can also stimulate monocytes to produce both pro-inflammatory and anti-inflammatory cytokines, which can help boost immune response. Monocytes also remove dead cells from infection sites to aid the healing process. Of course, there are certain instances where your immune system is overactive or under-responsive. 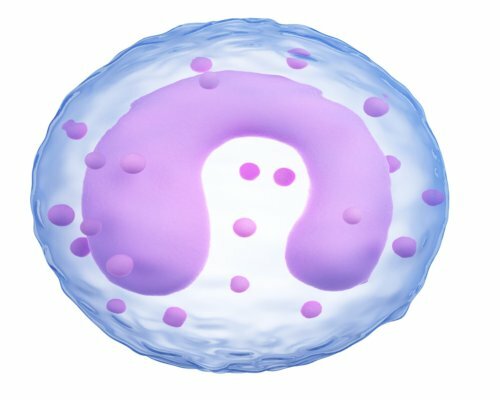 In these cases, monocyte activity may indicate harm—chronic inflammation—or leave you exposed to invaders. However, monocyte count or activity is not a symptom or health issue on its own. Instead, it is a marker of something else going on in the body. Your monocyte count is determined by undergoing a blood differential test, which examines the makeup of your body’s population of blood cells. There are a number of different types of white blood cells circulating in your bloodstream, and ideally, monocytes represent between one percent and 10% of them. The details of your monocyte count may help your doctor recognize potential blood disorders, autoimmune issues, heart disease, or cancer. That said, a blood test to distinctly measure monocyte counts is only done if a person is showing a range of symptoms that indicate an infection or autoimmune disorder. There are two ways doctors assess monocytes. Normal ranges are identified in both relative and absolute terms, indicated as a percentage of total white blood cell counts and as an absolute number. As mentioned earlier, a normal range is between one percent and 10% of total white blood cells, although some suggest it is between two percent and 10%. Absolute monocyte ranges are considered normal if they are between 200/400 to 600/1,000 cells per microliter of blood. Having low monocytes or high monocytes at the time of testing does not always indicate there is a problem, so follow-up tests may be required. For example, your body could be battling an infection or some other temporary illness during testing. It is only cause for concern if other symptoms are present, or if monocyte counts are out of a normal range over a series of tests. Monocytosis means there is an elevated monocyte presence in your bloodstream. This occurrence is usually in response to an infection being fought by the immune system. High monocyte counts are not always cause for concern, but they could indicate a major health issue if multiple tests show similar results over time. What’s considered “high” monocytes may vary between labs and organizations, but it’s usually diagnosed if more than eight or nine percent of your white blood cells are monocytes over a series of tests. If you go for a blood test and it turns out that you have abnormally low monocytes, also called monocytopenia, it could signal a serious health condition. When monocytes are high, it’s always possible the source is a normal immune response to an acute situation. On the other hand, if they are too low, it likely means either you are not producing enough monocytes or they are being destroyed too early. A “low” monocyte classification would show less than one or two percent monocyte presence in white blood cells. As with an elevated monocyte reading, low levels do not produce symptoms—they are a symptom of their own. Because monocyte counts outside of the normal range are symptoms of an immune response or health issue, they will not produce any unique symptoms. You may, however, be experiencing symptoms of a condition that leads to irregular monocyte levels. But there is no standard physical sign to indicate that your monocytes are too high or low. Inflamed or stiff joints: Chronic inflammation in joints caused by rheumatoid arthritis or lupus can boost monocyte levels. Easy bleeding/bruising: Unexplained bruising or easy bleeding is associated with chronically low levels of monocytes. This is also a symptom of certain types of leukemia, which is also a potential cause of abnormally low levels of monocytes. If you’re wondering how to treat high monocyte counts, the place to start is by looking at lifestyle factors that could be promoting inflammation. Again, high monocytes are a symptom of another condition, not their own issue. Therefore, by focusing on ways to limit overall inflammation, you can create a healthier internal environment that may lead to a more balanced immune response. If your efforts result in little-to-no change, you’re likely affected by a more severe condition in need of medical attention. Omega-3s: Fatty acids mainly found in fatty fish have been shown to reduce inflammation. Eating two 3-oz. servings of salmon, mackerel, sardines, and similar fish per week can help reduce inflammation that may decrease monocyte activity. Mediterranean diet: The Mediterranean diet, with its focus on anti-inflammatory foods like leafy greens, veggies, seeds, nuts, olive oils, and fish may prevent boosts in blood monocytes. Limiting alcohol consumption: Drinking more than one alcoholic beverage per day may increase overall inflammation that leads to high levels of monocytes. Limit alcoholic beverages to reduce the chances of inflammation and optimize liver health. Monitoring sugar intake: Sugars, particularly refined sugars, are closely related to inflammatory response. This means they can influence monocyte activity in the blood. Furthermore, a high sugar intake can encourage weight gain, obesity, diabetes, and other conditions that are associated with chronic inflammation. Monocytes are just one piece of the complex that makes up the white blood cells and your body’s overall immune response. Worrying about increased monocytes alone or searching for tips on how to treat a high monocyte count or lower your monocyte count won’t likely make a difference in your health. If your doctor suggests a blood test to get a better understanding of any health issues that may be affecting you, they will look at the entire picture to come up with the best treatment. When it comes to your monocyte levels, instead of focusing on how to increase them naturally, your monocyte percentage, or your absolute number of monocytes, focus on living a lifestyle that promotes low-inflammation and go to the doctor if, and when, you feel sick. Leave the diagnosis to the professionals. What Causes Elevated White Blood Cell Count? “Monocytes” U.S. National Library of Medicine, 2018; https://www.ncbi.nlm.nih.gov/pubmedhealth/PMHT0022057/, last accessed June 5, 2018. “Monocyte Count,” Allina Health, 2018; https://www.allinahealth.org/CCS/doc/Thomson%20Consumer%20Lab%20Database/49/150173.htm, last accessed June 5, 2018. Territo, M., “Monocyte Disorders,” MSD Manual, 2018; https://www.msdmanuals.com/home/blood-disorders/white-blood-cell-disorders/monocyte-disorders, last accessed June 5, 2018.